Aloe berry nectar is currently being widely promoted as a nutritional powerhouse, a delicious drink that can be taken at meals and one that contains a wealth of nutritional components. It is no secret that the aloe vera plant has long been praised for its medicinal and nutritional properties, though most uses of the aloe vera gel are as topical applications on the skin. Difficult To Find Objective Information - Most of the information one can gather concerning aloe berry nectar comes in the form of advertisements and promotions of the nectar as a health product. Given that, there understandably may be a certain lack of total objectivity. 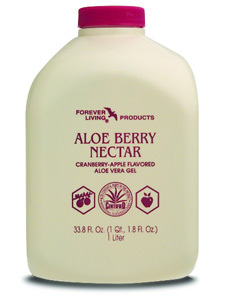 At least one will be hard pressed to find anything negative about aloe berry nectar. One web site even promotes the product as being very beneficial to pets, dogs especially, and recommends purchasing the product and adding the nectar to the water bowl or mixing it in with the dog's food. Also one comes across the usual hype of a product curing this or that, or preventing this or that. Foods we eat, be they natural products or a prepackaged mixture of different food items, seldom cure anything or prevent anything. What they do is bolster our health, making it less likely that we'll come down with specific ailments or diseases. If we are ill, these food products may help in our recovery. By themselves though, they usually don't cure anything. The same must be said for aloe berry nectar. From the information that is available, it definitely appears to be a very healthy and nutritious drink. Its ingredients are basically aloe vera gel (about 85%), cranberry juice concentrate, and apple juice concentrate. Some sugar is added for sweetening. Aside from the sugar, the other ingredients are all very healthy. While Aloe vera gel has many benefits, one would have to develop an acquired taste to drink it straight as it is very bitter. Add the two fruit juices and some sugar and you have a very good tasting drink that for all intents and purposes is a healthy one. Good For Stomach, Mouth, And Teeth - Best known as a healing agent when applied topically to wounds or burns, aloe vera has many benefits, either proven or considered helpful, when taken internally. It has known anti inflammatory powers and is also known to help relieve coughs, headaches, and constipation, and has a soothing effect upon ulcers as well as cold sores in the mouth. Perhaps it's best known use is in cleansing both the intestinal and urinary tracts. The gel from this all purpose plant is also becoming more widely used as either an ingredient in toothpaste or a substitute for toothpaste. It is a powerful cleansing agent, rejuvenates the gums, and does not contain the abrasives used in most brands of toothpaste. Cranberry juice also promotes healthy gums and when taken regularly keeps oral bacteria in check. Cranberry juice is also well known for its abilities in preventing and helping to heal urinary tract infections. Both cranberry juice and apple juice are loaded with vitamins and other nutrients, with apple juice being an excellent source of potassium which our body must have. Does Three Times One Always Equal Three? -When you mix three healthy juices together, there isn't any guarantee that the result will be a juice that's three times healthier to drink. It's probably safe to say however that aloe berry nectar is a healthy drink. At least there hasn't to date been any information forthcoming that this drink has any known side effects. Since you can go overboard and eat or drink too much of almost anything, It would probably be best to stay within recommended dosages, something like a glass a day if you like it (and you can afford it). Just be aware that with all the healthy ingredients, you're getting a fair dose of sugar at the same time.